Opioid misuse and its consequences have been at the forefront of drug policy for several years. 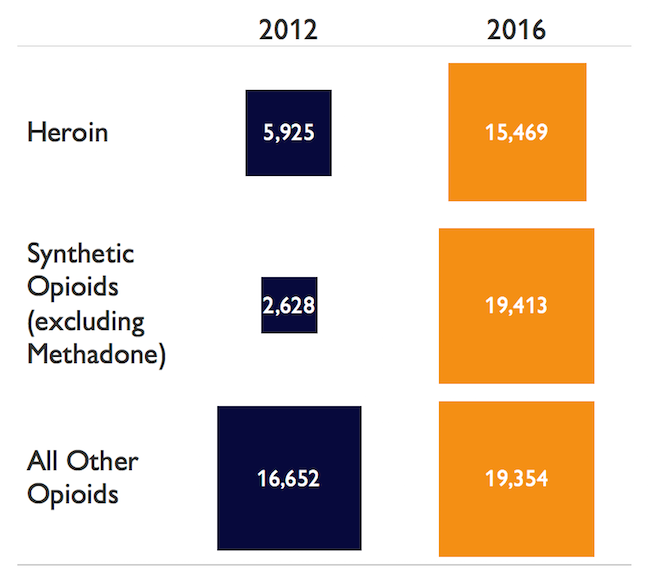 The growing numbers of opioid-related deaths demonstrate that the crisis rages on, despite some notable policy successes. Yet the opioid crisis has not remained stagnant and it is not the only drug policy challenge. Rising cocaine use is leading to more cocaine-involved deaths, and attitudes toward marijuana continue to soften as legal changes increase availability. The factors that contribute to use – price and availability, perceptions of harm and social acceptance, and perceived benefits – wax and wane, affecting society’s appetite for specific drugs. These changes cause new trends and, potentially, new epidemics. Several drugs are now emerging as causes for concern – and for immediate policy action. In August 2016, Carnevale Associates identified rising Colombian coca cultivation and increasing cocaine initiation (first-time use) as evidence of an emerging trend of cocaine use in the United States. The evidence has only strengthened in the interim. Use by young adults is also on the rise and cocaine-involved overdoses have exploded. Colombian coca production more than tripled between 2012 and 2016 – reaching 910 metric tons of export-quality cocaine. Over the same period, prices have fallen 23 percent (from $215/gram to $165/gram) while point-of-sale purity increased nearly 20 percent. This paired change indicates a rising street supply of cocaine. Data also show rising numbers of initiates and increased use among young adults. The rate of past-year cocaine users among those aged 18-25 rose nearly 22 percent between 2012 and 2016, based on the National Survey on Drug Use and Health (NSDUH). First-time use of cocaine also rose by 70 percent over the same period – reaching 1,085,000 initiates in 2016, a return to numbers not seen since 2002-2007. Rising initiation rates are often the first sign of further increases in regular use. Greater consequences from this increased use are already observable. Rates of fatal overdoses involving cocaine increased 135 percent from 2012 to 2016, according to the Centers for Disease Control and Prevention (from 1.4 per 100,000 to 3.2 per 100,000). The rise in cocaine use is also interacting with the opioid epidemic. Fatal overdoses involving opioids and cocaine increased 63 percent over the same period. Policymakers must address this cocaine trend while it is emerging. The current opioid epidemic is not new. It began with prescription opioid misuse, but heroin and synthetic opioids—especially illicitly manufactured fentanyl—are emerging as a growing problem. Fatal overdoses involving opioid medications (e.g., oxycodone, hydrocodone, methadone, etc.) rose 16 percent from 2012 to 2016 – reaching 19,354 fatalities. But fatal overdoses involving fentanyl and fentanyl-analogues increased by a staggering 639 percent over the same period. In 2016, there were actually more fatal overdoses involving fentanyl and its analogues (19,413) than there were involving opioid medications (19,354). The Drug Enforcement Administration’s 2017 National Drug Threat Assessment also reports increased illicit fentanyl production, indicating that potency alone is not likely to be driving the rise in overdose deaths. Meanwhile, heroin has also surged since 2012. Fatal overdoses involving heroin increased 162 percent – reaching 15,469 in 2016. And the number of past-year heroin users increased from 669,000 in 2012 to 948,000 in 2016, according to the NSDUH. Policymakers have focused on opioid medications, with some positive results. The rate of past-year nonmedical use of prescription pain relievers declined from a high of 4.9 percent in 2009 (12.4 million individuals) to 3.9 percent in 2014 (10.3 million individuals). But despite that improvement, rates remain above pre-epidemic levels. And the number of fatal opioid overdoses is still rising. The dramatic rise in fatal overdoses involving illicit opioids  requires a solution. But most of the successful prevention strategies employed for opioid medications are not applicable to illicit substances – Prescription Drug Monitoring Programs, prescriber education, abuse resistant drug formulations, and prescribing/dispensing policies do not work for heroin or illicit fentanyl. Ironically, successful prevention measures may offer one explanation of the current shift away from prescription opioids toward heroin and fentanyl. Prevention should adapt by expanding efforts to include more education and public awareness along with a continued expansion of harm reduction strategies, such as overdose prevention and linkage to treatment. Policymakers must also confront the spread of state-level legalization of marijuana– even as it remains illegal under federal law. Despite signals from the Trump Administration, the trend of state-level legalization appears to be continuing. So far, nine states and the District of Columbia have legalized recreational use, affecting over 21 percent of the U.S. population. Another seven states have active efforts to obtain ballot measures for legalization referenda in November 2018, and at least one state (New Jersey) has an active effort to legalize through the legislature. In November 2016, Carnevale Associates highlighted the need to adjust the policy debate to reflect changes in state law and public opinion. Research has not established any causal link between increased marijuana use by teens and young adults and state-level legalization. But some trends are observable. While the debate and implementation of marijuana legalization has been occurring at the state level, marijuana use among those aged 18-25 has also been rising. At the same time, perception of the harm of marijuana use has been falling among those aged 12-25. Initial data also show rising rates of marijuana use among adults over age 25. Policymakers must decide to what extent they engage with the legalization debate and what their goals are within it – including, but not necessarily limited to, preventing youth use. Prevention stakeholders should consider whether, when, and how to become involved in the legalization debate, including whether they wish to help influence the regulatory framework. Policymakers must then determine how to maximize public health priorities within any framework that is enacted. Prevention stakeholders must also be aware of weakening protective factors against marijuana use (especially perceptions of harm) among youth and develop strategies to address this shift, regardless of the outcome of state-level legalization. Prevention has notoriously limited resources. Declining funding for prevention  likely contributes to the lack of epidemiological data and a dearth of evidence-based strategies. Prevention has also been hurt by the termination of surveillance systems for budgetary reasons, such as the Arrestee Drug Abuse Monitoring (ADAM) program and the Drug Abuse Warning Network. With surveys like the NSDUH and Monitoring the Future limited by inherent data lag, it is now much more difficult to identify and respond to emerging trends. Yet even when trends are identified and targeted, there is often insufficient research to inform policies and programs. There are no easy solutions to these resource limitations but, as with most policy, proactivity is more efficient than reactivity. Improvements to the prevention infrastructure are often simple but have proven politically difficult. They are increasingly important in light of the newly emerging trends. Enhance Local Prevention Efforts. Local preventionists are most familiar with the specific prevention needs of their community. Enhancing local prevention efforts is the most effective way of ensuring that available resources are targeting key areas of need. Federal and state agencies should expand the availability of funding for local prevention entities, particularly funding for school- and community-based prevention services. Training, Technical Assistance, and Evaluation: More research is needed, but data supports the efficacy of specific prevention strategies in certain situations. Yet many preventionists are unaware of the latest findings or lack the capacity to implement proven strategies. Federal and state governments should expand funding for training and technical assistance (TTA) programs targeting local preventionists. This TTA should include how to evaluate prevention efforts as part of a feedback loop to improve local responses and how to disseminate findings to build evidence for the field. Focus on Local Data: With most drug control efforts occurring at or focusing on the local level, it is vital that stakeholders have access to plentiful, high-quality local data to assess local trends. Federal and state governments must build the capacity to collect and analyze local data, including training and funding local stakeholders. Reinvest in Surveillance: The federal government must reinvest resources for surveillance systems to detect emerging drug trends. In FY2000, the Office of National Drug Control Policy (ONDCP) estimated that a 15-city expansion of ADAM would cost only $4.8 million, adjusted for inflation this would be approximately $7 million in FY2018. Although the true cost may be higher for logistical reasons, it would be a small price to pay to regain an information system that proved invaluable to consumption estimates. Prepare for Future Emerging Trends: Because long lag time is inherent to the evaluation process, prevention researchers should allocate some resources to issues that are not “hot topics” of the day, strengthening the initial evidence base from which to work if and when issues do arise. Each of the emerging trends we consider—the return of cocaine, the shifting opioid crisis, and the state legalization of marijuana—is unique; yet, each merit greater attention from drug control policymakers and preventionists. Effective prevention is the best chance to avoid the catastrophic effect of drug epidemics. Policymakers must examine the context of each trend, understand the ongoing prevention efforts, and build on those efforts in effective ways. Though the emerging trends are specific, our recommendations are not. Drug trends evolve over time. With national-level assistance, local stakeholders should assess local needs and drive local efforts to prevent drug epidemics. Enhancing prevention infrastructure will improve the ability to address these emerging trends and detect other troubling patterns before they become larger problems. Colombia traditionally produces cocaine for the U.S. market and there are no indicators that this cocaine is intended for export elsewhere. These and other fatal overdose figures are likely under counts. In 2015, NSDUH changed its prescription pain reliever classification from non-medical use to misuse. After the change, the past-year rate of prescription pain reliever misuse declined from 4.7 percent in 2015 to 4.3 percent in 2016. Fentanyl can be legally prescribed but neither state PDMPs nor the DEA show any recent increase in legal fentanyl distribution. Vermont’s effort shows that states can follow paths other than the adoption of a commercialized regulatory system based on the alcohol model. ONDCP reports that federal prevention resources have declined from $2,033.6 million in 2004 (approximately $2.6 billion in 2017 dollars) to $1467.5 million in 2017, a 27.9 percent decline in nominal dollars and an approximately 44 percent decline in real dollars.